The Iriomote cat (Prionailurus iriomotensis; Japanese: Iriomote-yamaneko), is a wild cat about the size of a domestic cat that lives exclusively on the Japanese island of Iriomote. It is considered a "living fossil" by many biologists because it has not changed much from its primitive form. The Iriomote cat is one of the most threatened species of cat (formerly considered a subspecies of the leopard cat), with an estimated population of fewer than 100 individuals. It has dark brown fur, a bushy tail, and it is not able to sheathe its claws. When it was discovered in 1965, it was regarded as a survivor of an extinct line of felines and placed in a separate genus Mayailurus as Mayailurus iriomotensis. It was then assigned as a subspecies of the leopard cat, before being elevated to the species level again within the same genus of the leopard cat, Prionailurus. This view is still being discussed: some authorities still claim to classify the Iriomote cat as a separate species, since it looks quite different from the mainland leopard cat. It is known as Yamamayaa ("mountain cat") or Yamapikaryaa ("mountain sparkling-eyed") or Pingiimayaa ("escaped cat") to the islanders of Iriomote. The Iriomote cat has dusky or greyish brown, dark spots in dense longitudinal rows that mark its body. The spots tend to coalesce into bands. Five or seven dark stripes run along its neck, and two white lines run from the corners of each eye across the cheeks. Thick and bushy, the tail is relatively short; spotted near the base it is ringed toward the tip. The backs of the rounded ears are dark with white central spots. The anterior upper premolar is absent. 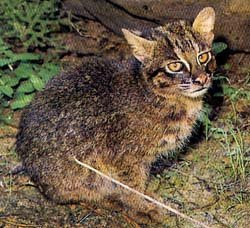 Approximately the same size as a domestic cat, the Iriomote cat has the characteristic elongate body, short legs and low-slung build of a predator which forages in thick undergrowth. Females average body size is 48 cm (19 in) excluding the tail and males are slightly larger at 53–56 cm (21–22 in) excluding the tail. Both sexes are otherwise the same, with overall head and body length range of 38–65 cm (15–26 in). Height at shoulders is 25 cm (10 in), tail length averages 16–45 cm (6.3–18 in) and weight averages 3–7 kg (6.6–15.5 lb). The Iriomote cat is solitary but home ranges of individuals overlap. Male home ranges vary from 2.1 to 4.7 km², and those of females 0.95 to 1.55 km². Hunting day and night both in trees and on the ground, the Iriomote cat is an opportunistic generalist predator. It is said to be more nocturnal in summer than winter. During the day it will hide in rock crevices or tree cavities, leaving to hunt at dusk. In captivity, it is an enthusiastic swimmer, playing in the water. Known to cross rivers in the wild, it probably also catches fish and crabs in the water. Hunting is usually a slow stalk finishing with a quick rush to kill. Captive animals lose weight in winter and spend more time urine marking. This is seen as preparation for mating. They are more frequently seen in pairs in winter and often heard to vocalize. Males often fight. They meow and howl like domestic cats. Mating is believed to occur from February to March and September/October. After a gestation of about 60 days, two to four kittens are born in a den in a rock crevice or hollow tree. The kittens mature much more rapidly than domestic cats, being left on their own when they are about three months old. In one study 50% of the prey biomass was identified as mammalian in origin, with about 25% of the mass bird and 20% reptilian. In summer, the cat's emphasis on mammalian prey seems to change, with more birds and reptiles taken. Numerically, insects are important, making up one third of the total numbers of items found in scats with 39 species of beetle have been identified in them. The Iriomote cat is known to take fruit bats, black rats, wild pig, night herons, quails, rails, pigeons, doves, frogs, scops-owls, kingfishers, robins, thrushes, crows, box turtles, and skinks. More than 95 species of animal have been identified from its feces. The 292 km² island of Iriomote is at the southern end of the Japanese Ryukyu Islands, which are 200 km (125 mi) east of Taiwan (24° 15´–25´ north Latitude and 123° 40´–55´ east Longitude). The island is mountainous and covered in broadleaf, evergreen, subtropical rainforest with dense mangroves along the estuaries. The highest mountain is only 470 m (1540 ft). 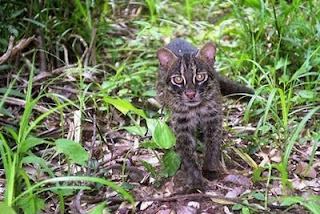 This endemic cat is found, near water, all over the island, including beaches and cultivated land. It only avoids the most heavily populated areas. Unfortunately, it shows a preference for the coastal forest areas which are mostly outside the protected area of the island and through which the island's road has been constructed. Barely 100 individuals survive due to habitat destruction and persecution/over-hunting. Although in 1977 the Iriomote cat was declared a National Japanese Treasure, pressures of development pose a very serious threat. One third of the island has been declared a reserve where the trapping of the cat for any reason is strictly prohibited. However, the species continues to decline. Izawa (1990) reported that the density of the cats was relatively low inside the National Park because they prefer forest edges, coastal areas and lowlands, most of which are outside the protected areas. There is no captive breeding population. The International Union for the Conservation of Nature and Natural Resources (IUCN) has listed the Iriomote cat as Critically Endangered, on the verge of extinction. As the cat is not substantially traded, the Convention on International Trade in Endangered Species (CITES) has only declared that international commerce must be strictly regulated, and has placed it on Appendix II. Feral domestic cats compete with the Iriomote cat for food, but at the moment there appears to be no problem with the two species interbreeding. Hybridization would dilute the gene pool of the Iriomote cat and could be a disastrous long-term threat to the integrity of the species. Proposals have been made to eradicate all feral cats on the island. The Japanese Environmental Agency set up feeding programmes for the native cat. Since 1979, domestic chickens have been provided at 20 feeding sites. However, this has caused problems as the cats now regard farmer's flocks as a natural food resource. 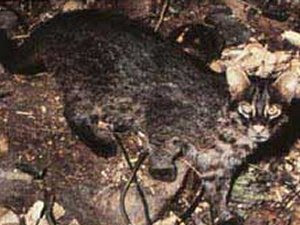 In 1983, the Iriomote cat began to attack domestic chickens at village houses. This conflict is obviously very undesirable. The meat of the cat is considered to be a delicacy on the island and a significant number have also been killed on the roads. Despite these problems, many of the inhabitants of Iriomote are proud of "their" cat.